Thinking of selling your home at auction? If you’re carrying research before committing to an auction sale, be careful about information from biased sources (e.g. estate agent websites). Our guide provides honest and straightforward answers to the most frequently asked questions about selling at auction. Auction can be a quick and reliable way to sell a property. And there are reasons why highly profit driven companies (e.g. banks and mortgage companies) sell their properties through auction. But auction is not suited to all property types or personal circumstances. 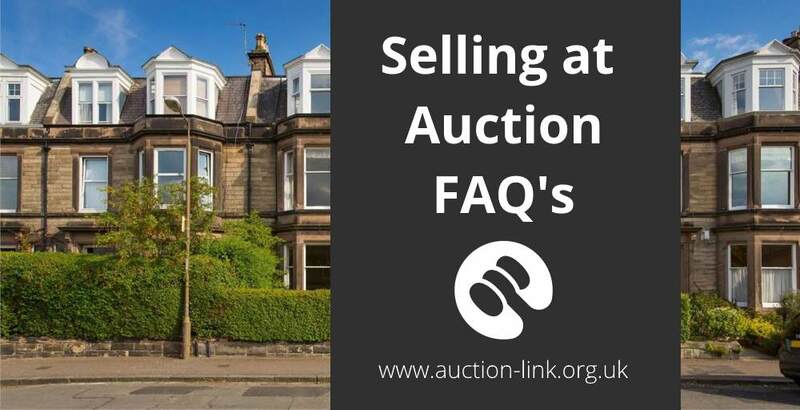 If you’re weighing up your options and need help deciding whether to sell through an estate agent or at auction then you might find these FAQ’s to be useful. The main benefits of selling at auction are speed, reliability and transparency. The total lead time (from booking into auction to receiving completion funds) is around 6 to 8 weeks. On auction day contracts are legally exchanged with a date for completion agreed. Auction is a transparent process, opening a property up to the whole market; the seller provides information to many buyers and it’s up to the buyers to decide how much to bid for the property. The concern most people have when selling their property at auction is the worry that only one person will turn up on auction day and the property will end up being sold at the reserve price. That’s why some view auction as a “bit of a gamble”. But like most risks, there are ways to manage and reduce the chances of loss. Also, auction isn’t suitable for every type of property, there are some property types where using an estate agent will achieve a better sale price than auction e.g. luxury properties. Auction fees are negotiable and work out to be around the same as you would expect to pay a high street estate agent. Commission is typically in the region of 2% and that’s only paid if the sale is successful. Some auctioneers also charge an entry fee of about £300 and will usually be happy to take payment after the sale – only if the property sells, if you ask nicely! For more information about auction costs see the page auction fees for selling property. The total lead time is around 8 weeks. If you booked your property into auction today you could expect to exchange contracts in 4 weeks and complete the sale 4 weeks later. We’ve provided more information about the auction process and timescales. What is the auction reserve price? The reserve price is the minimum amount a seller will accept for their property. If a property sells for the reserve price or more, the seller is obligated to sell. You can find more information about the reserve price and how it’s calculated. The auction legal pack contains all the important documents for prospective buyers to view before the auction. The documents include the title document, deeds, searches, contract of sale etc. The auction legal pack is compiled by the sellers solicitor. Does my solicitor have to attend on auction day? No, there is no requirement for your solicitor to attend the auction. All the contract paperwork will be prepared by your solicitor in advance of the auction, so there is no need for you solicitor to attend on the day. The auctioneer facilitates the sale on auction day and your solicitor will take care of completing the sale within 28 days of auction day. You are more than welcome to attend the auction (so is your solicitor) but there is no requirement to do so. What’s the difference between “modern” auction and traditional auction? If you’re struggling to sell your property, your estate agent might suggest using their in-house modern auction. These are online auctions that operate on a similar basis to ebay, the winning bidder will have to pay a reservation fee (usually around 5% of the purchase price). For more information read our guide to modern auctions. The marketing carried out by an auction company will usually generate a good level of interest and you might receive offers before the auction. We always recommend referring any prospective buyers to the auction company to let them suss out whether the buyer is genuine and credible. Even if they are a credible buyer it’s usually worth letting the property run on to auction rather than accepting an offer before the auction. You never know, the prospective buyer might know something about your property that you don’t – there might be more potential than you thought! By letting prospective buyers fight it out for your property you will see the benefits of competitive bidding that auction offers. What happens if my property doesn’t sell at auction? If bidding doesn’t reach the reserve price on auction day then a property remains unsold. The auctioneer will try to arrange a sale immediately after the auction by contacting buyers who have expressed an interest. If there’s still no sale then most auctioneers will carry on marketing the property for a month or so after the auction to try and agree a sale. If the property is still unsold then you can either re-enter into the next auction or try another method of sale. The auctioneers commission will not be payable if the property fails to sell (subject to the particular terms you sign) but there may be fees payable to your solicitor for preparation of the legal pack. The majority of properties do successfully sell at auction, but if your property doesn’t sell on auction day you’re not out of options. Is my property suitable for sale at auction? Any type of property can be sold at auction, unless there are restrictions in the lease or deed (e.g. some retirement properties have such a clause in the lease). Although some properties are better off sold through an estate agent (e.g. luxury properties that need a longer marketing period than the usual 4 weeks offered at auction) where they will benefit from a more managed sale an estate agent can offer. Some properties sell particularly well at auction: properties in need of improvement, tenanted properties, investments, development propositions, building land, mixed use properties, short lease flats, commercial investments and unique properties. For more information please see our guide to what types of property are best suited to an auction sale. When will I need to vacate my property? When a property sells at auction, legal contracts are exchanged on auction day and the standard timescale for completion is 28 days (i.e. 4 weeks) – that’s when keys are passed to the buyer and the seller must vacate the property. If a seller needs more time to move out of the property they can ask their solicitor to change the completion date (this must be done before the auction). It’s not unusual to see auction properties listed with completion dates as “6 weeks or earlier by mutual agreement.” This means completion will take place 6 weeks after auction day, unless both the buyer and seller are in a position to complete sooner. Can I use an estate agent alongside an auction sale? Auctioneers require exclusivity in order for their marketing effort to be effective, and to avoid and risk of disruption from estate agents. If your property is currently listed with an estate agent and you wish to sell at auction, you will need to serve notice to your estate agent. There may be some overlap between the auction marketing beginning and your estate agency contract ending (because the notice period for estate agents is typically 2 to 4 weeks). In most cases, as long as you’re not under contract with your estate agent by auction day, or sometimes the day of completion, then you shouldn’t be liable to paying your estate agent any commission when your property sells at auction. If in doubt, check through the terms you signed. Sometimes estate agents can make it difficult to exit their contract, so it can be easier to serve notice without giving a reason and take the estate agents story of a “very keen cash buyer” with a pinch of salt. They’re probably just trying to retain their instruction! Should I allow my estate agent to reduce the asking price before I consider an auction sale? If your property has been on the market for a while, you might have noticed how your estate agent is always keen to reduce the asking price. A lower asking price can be a good way to generate interest, but if you’re considering selling at auction, we would recommend keeping your asking price high so the marketing history looks better for auction buyers. If auction buyers see the property has been on the market at a lower price, they might not be inclined to bid so high. Reducing the asking price can often be a slippery slope. If you’re considering an auction sale but locked into an estate agency contract for a few months, tell your estate agent that you’re open to offers, but not to reduce the asking price. The important thing to remember is that with an estate agency sale the price only ever goes down (unless the market is booming) and with an auction sale the price only ever goes up. What’s the risk of a sale falling through at auction? For estate agency sales, it’s estimated that one in three house sales fall through and that’s because sales are “subject to contract”, or subject to the buyer changing their mind! But at auction, sold means sold. On auction day the winning bidder pays a 10% deposit and signs a contract of sale. Contracts are formally exchanged with a completion date set for 28 days after. It’s very, very unusual that a buyer fails to complete, because if they do, they will lose their 10% deposit and could be sued by the seller. How will my property be advertised for an auction sale? A sale by auction includes the same advertising as an estate agent would use, plus more. Your property will be listed on the usual portals (e.g. Rightmove and Zoopla) as well as the auctioneer’s website. The auction company will also print a catalogue including details of your property and send to their registered buyers by post and email. Most auctioneers will also ask if it’s okay for a “for sale” sign to be put up outside the property. Signs help generate interest in the immediate area, but some sellers of vacant properties worry about security and the wrong type of attention a sign might generate. If you would rather not have a sign, just let the auction company know. The word “auction” comes from the Latin word meaning “to increase” and is a method of sale designed to have a buyer pay as much as possible, without any ceiling price.